Your seating plan is complete, the decor picked out, the music playlists created. Almost everything is in order and ready to go. But what about the guest favors? How can you best show your nearest and dearest your gratitude for their support? Picking out the perfect guest gift might seem like a task and a half, what with all the considerations: Will it get thrown in the trash? Is it affordable, but classy? Will Grandmother appreciate it as much the maid of honor? Gathering your wedding favors should be as much fun as cake creating and dress shopping. Giving a gift of gratitude, one that you’re proud of and know that others will love, is just as likely to warm your heart as much as your first kiss as newlyweds. Okay, maybe not that much, but seeing your guests smile (and no favors left behind) will definitely put you at ease. I’ve put together a collection of what I think are the perfect gifts for your wedding guests. Perfect because they’ll delight a wide range of ages and personalities and have some practical uses (even if practical means beautiful to look at). Drinkables, whether alcoholic or not, are a close second on the popularity scale to edibles. 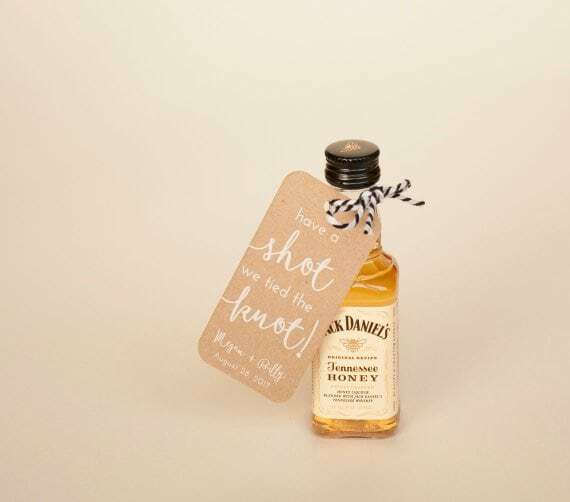 Depending on your crowd and wedding theme/venue you might consider setting out mini bottles of booze with favor tags attached, or double up the gift by including a pint or shot glass. As for whether or not to monogram the glasses, I always say steer clear, just to be safe. Although it’s a small detail and you’re probably asking, “Aren’t monograms ubiquitous to weddings?” you should also ask, “What would I prefer?” Would you want a five year old monogrammed pint glass in your collection? Probably not. Keep it clear, keep it timeless. Of course, you don’t have to go the alcohol route. You can also gift coffee beans/grounds (look into local blends for a unique taste) and loose leaf or bagged tea blends. You could even set up a table of different kinds of loose leaf teas and let guests create their own blends. If you would rather dedicate your funds to the bigger picture, consider donating the cash you would have used on favors to a cause you and your partner are passionate about. 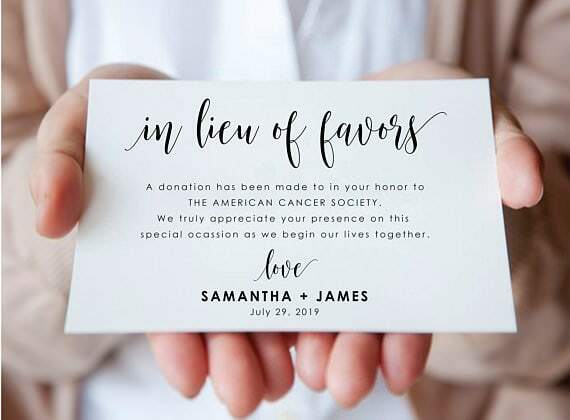 You can insert a small card into the wedding program, place them on each table, or frame a larger card that guests will see when they enter the reception area. 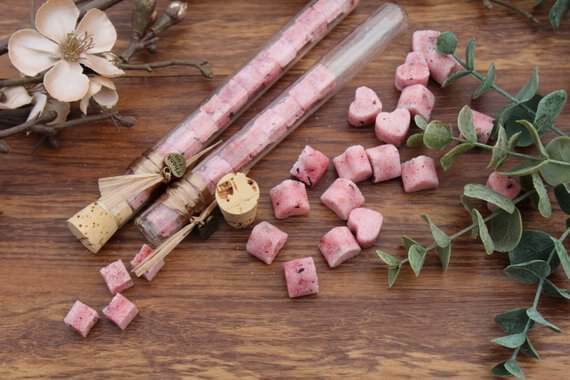 Whether it’s a candle that fills the home with warm vanilla or a sachet of French lavender potpourri that’s placed in a linen drawer, people love items that delight the senses. 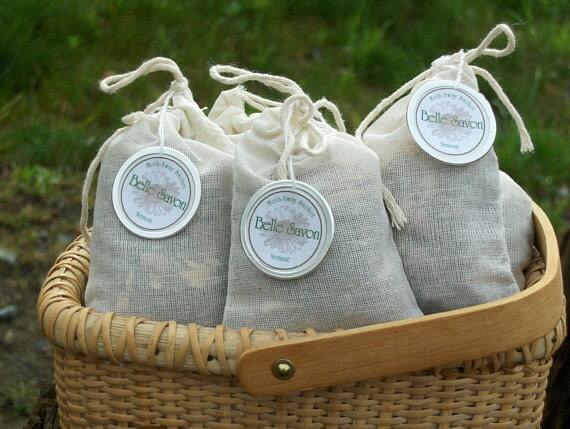 You can even present a more practical sweet smelling gift, like the sachets above that are filled with cedar, lavender, and other herbs that ward off moths. Let your wedding season help you decide on the perfect guest gift. For example, set out a basket of shawls for a winter wedding, flip flops or sunshades for a summer celebration, wildflower seed packets for a spring wedding, and pumpkin spice anything for fall. If you love getting crafty and want to create a special gift for your wedding guests, go the homemade route. There are a billion and one tutorials online for just about anything you’d want to make. 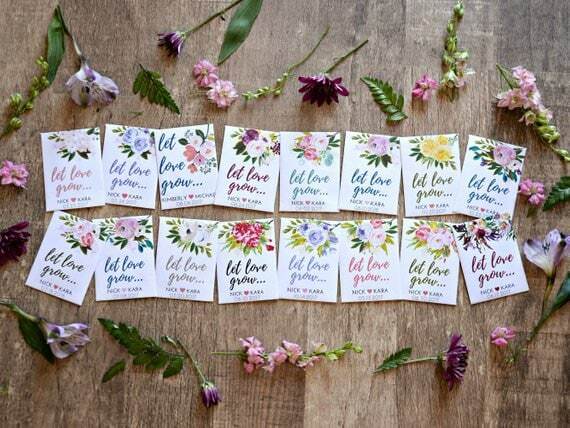 If you already have an idea, go ahead and search for that particular tutorial, but if you’re still up in the air about the kind of favor you’d like to handcraft, take a trip to Pinterest and look up DIY wedding favors. You’ll find everything from mini bouquets and herbal soap to photo cards and bookmarks. Even if your wedding doesn’t have an open bar, there will inevitably be guests who find their way to hangover city. If not after the wedding, at some point! 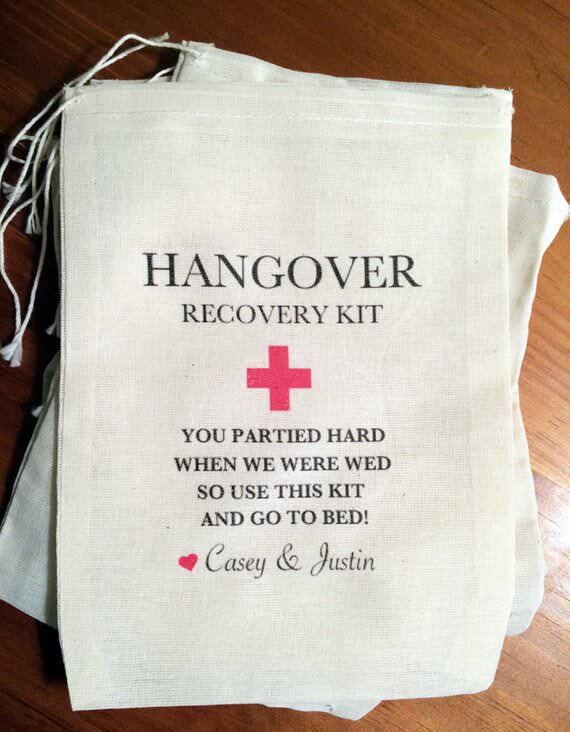 Luckily, they’ll have a handy hangover kit to get them through the next day. Fill a bag with hangover essentials like pain relievers, an eye mask, antacid tablets, and snacks and attach to a bottle of water or bloody mary mix. You might even want to make one for yourself! There you have it! 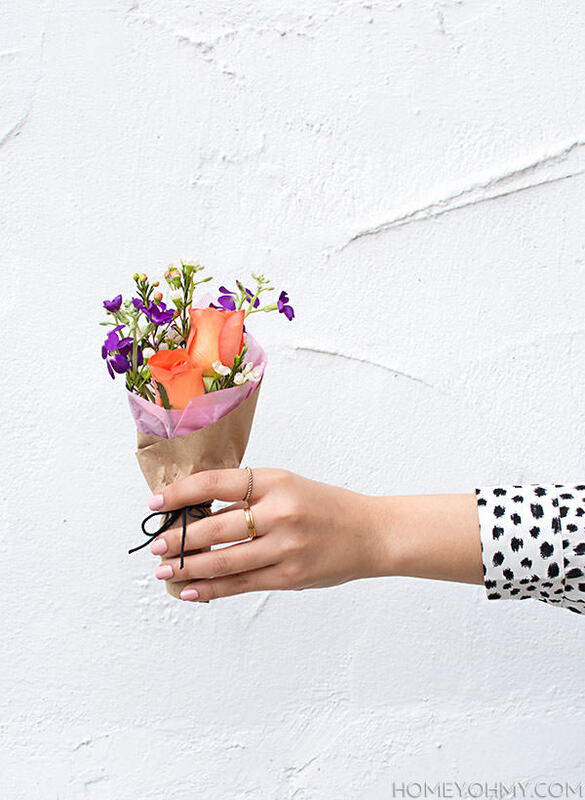 Some pretty perfect gifts to satisfy just about any wedding guest. Just remember, you won’t be able to please everyone, and you might even see a few favors lingering at the end of the night, but I’m willing to bet these options will linger much less than a monogrammed koozie or temporary tattoos of you and your honey’s portrait (yes, it is a thing). Are you still looking for the perfect gift for your wedding guests? I have so many more ideas from all the weddings I’ve been to. Click the button below and let’s talk!